Zagreb: The stars of last year’s World Cup had to dig deep as European Championship qualifying began. Even with Romelu Lukaku and Kevin de Bruyne missing through injury, Belgium took a big step toward qualifying by beating Russia, their main rival in Group I.
Youri Tielemans’ early goal for Belgium was cancelled out when a Courtois gave away the ball in a rare blunder which allowed Russia’s Denis Cheryshev to score. 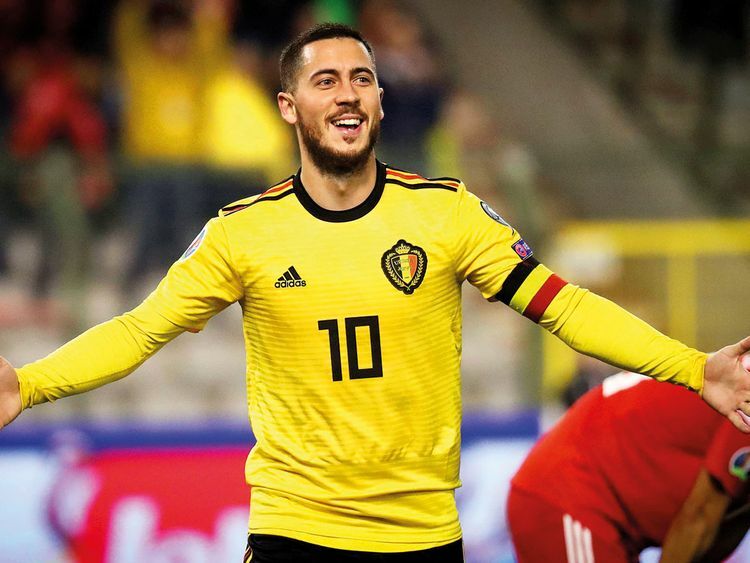 A new-look Russia team struggled to track Hazard and when defender Yuri Zhirkov tried, he ended up tripping the Belgian and giving away a penalty which Hazard converted. Ever since losing to France in the World Cup final, Croatia have struggled to replicate the form of their greatest ever tournament showing. Azerbaijan — by far the lowest-ranked of all next year’s 12 European Championship hosts — took the lead with a fine solo goal. Ramil Sheydaev sprinted down the right flank in the 19th before striking the ball over the goalkeeper. Azerbaijan then sat back to defend, frustrating Croatia, who came close with headers from Andrej Kramaric and Luka Modric. Croatia finally levelled in the 44th thanks to Borna Barisic’s quick reactions to jab the ball in on a rebound. A moment of skill from Kramaric finally cracked the tenacious Azerbaijan defence as he cut in from the left flank and curled the ball in at the far post. Memphis Depay needed just 50 seconds to score as the Netherlands continued their fine form from the Nations League with a straightforward win over Belarus in Group C.
Depay back-heeled a pass from Denzel Dumfries for Georginio Wijnaldum to score in the 21st, then converted a penalty in the 55th. His cross for Virgil van Dijk to make it 4-0 in the final minutes capped a dominant display. The defender has now scored three goals in his last four games for the Netherlands. Northern Ireland ended a four-game winless run by beating Estonia 2-0 in the other Group C game. That helps their chances of reaching the European Championship for the second time ever, following a run to the last 16 in 2016. After a poor 2018 for Poland, their first game of 2019 offered fresh hope in a tight 1-0 win over Austria in Group G.
Poland arrived at last year’s World Cup fresh off a dominant qualifying campaign, but went on to finish bottom of both their World Cup and Nations League groups. Krzysztof Piatek scored the winner in the 69th minute as Austria failed to clear the ball from the penalty area. That ended a six-game winless streak for Poland, including friendlies.